It's October already and that means it will soon be time for Samhain, All Hallows' Eve, Halloween. Three different names (depending on your belief system), but just one dark night when the veil between existences grows thin and the dead walk alongside the living for a few precious hours, but who knows what else might cross over with our dear departed? Who knows what else may already be here living among us and what exactly do you mean by "us" or "I", come to that? 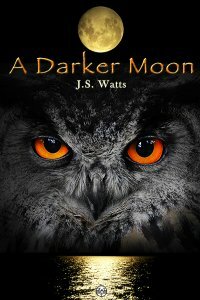 If your idea of a good Halloween is to curl up with a dark and disturbing story, this may be just the right time to order your copy of A Darker Moon, the dark-fiction novel by J.S.Watts. "a wonderfully poetic novel, as well as a great read"
"a version of the oldest story. The story of what defines human lives in the overwhelming order of creation"
So what are you going to be reading this Halloween?